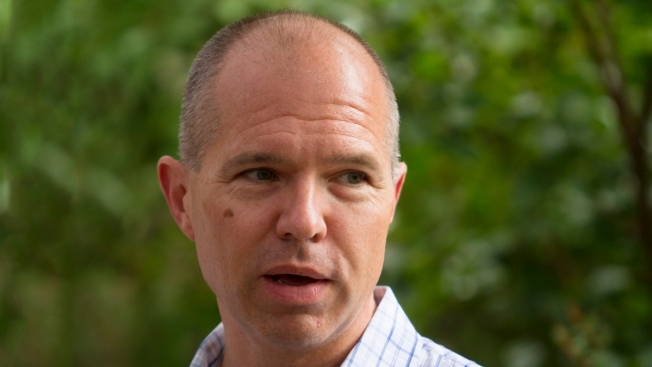 David Catania Hopes Experience Is Enough to Lead D.C.
Catania: "This election is going to be about trust"
David Catania believes his 17 years on the D.C. Council are enough to trump his competitors in November's mayoral election. Catania, 46, moved to the District in 1986 to attend Georgetown University. He served as an Advisory Neighborhood Commissioner and was elected to the D.C. Council in a special election in 1997. Then a Republican in a heavily Democratic city, Catania also was the council's first openly gay member. "I wouldn't have had the same opportunities in the Midwest [that I do in D.C.]," Catania said, recalling his childhood in Missouri. Catania most recently has championed education reform legislation as chairman of the council's education committee. He formerly was chairman of the council's health committee, where he helped save the Southeast Washington United Medical Center (formerly known as Greater Southeast Hospital). In 2004, Catania left the Republican Party to become an independent after he broke with President George W. Bush and the rest of the GOP over LGBT issues, including support for gay marriage. "There were other issues of intolerance, too, on social issues," Catania says. Of the current campaign for mayor, he says, "This election is going to be about trust. It's certainly based on past practice. I have a record of delivering on issues that people care about. A lot of politicians talk about what they're going to do and they don't have a record to show for it. I absolutely do." Catania's work on the United Medical Center drew some controversy and complaints about his aggressive -- some would say abusive -- style of questioning city officials and private contractors connected to the project. "Look, I'm never going to apologize for the passion I bring to this job," he said earlier this year. "You know, when I look around this city, we need to have passion to solve our problems." The District has expended about $100 million to help keep the hospital open. It's the only such facility east of the Anacostia River. Catania is adamant his Democratic opponent Muriel Bowser lacks a proven record, especially in her handling of affordable housing in one of the nation's most expensive cities. "In the last 20 months during the [affordable housing] committee, there has not been one substantive measure that's gone up for a vote," Catania said, noting that Bowser chairs the housing committee. "We have not had an affordable housing plan in years.... There's an absence of accountability." Catania has a chance to appeal to votes that might normally go to Bowser in November, according to Tom Sherwood, News4 political reporter and guest analyst on WAMU's Kojo Nnamdi Politics Hour. "In a city that is about 75 percent registered Democrats, it's up to Independent Catania to break through to voters and tell them why he is the better choice," Sherwood said. "The April Democratic primary had a dismal turnout, so voters may be amenable to voting for Catania over Bowser, if he can make the case that Bowser is a lightweight. Bowser, the Democrat, has to show voters that she has the wherewithal to be mayor and that it means something for Democrats to 'stay home' in their party and vote for her." Sherwood also notes that Bowser has raised more campaign funds and has a field organization that she says will get out the vote and carry her to victory Nov. 4. And Bowser insists her record is far better than the one described by Catania. During the Democratic primary that Bowser won, Catania had said his "record more embodies Democratic values than the field, candidly, running as Democrats," reported Washington City Paper. Many local political veterans and observers and are worried about a low-turnout election. The April 1 primary had a low turnout. Bowser easily defeated incumbent Mayor Vincent Gray, who has been struggling with scandals dating back to his 2010 election victory. "The mayor has been reduced to a joke," Catania said two years ago. "He is a laugh line. He is an embarrassment." Catania, and later followed by Bowser, rejected the lame-duck mayor's controversial plan for the reorganization of the city's school boundaries -- the first effort in 40 years to align the city's growing population with existing schools. "I don't think any of us anticipated the changes would be so broad in scope as we received," Catania said. "It's too much for our parents to digest at the same time. Here are many students who will be forced into schools that are lower quality than the ones they currently attend. That's unacceptable." Catania has said he would "press pause" and delay any school boundary changes at least until the 2016-2017 school year to educate parents on the changes and give the city time to improve schools that may receive new students. He has spent the past year and a half touring the District's 200 schools, meeting with parents and educators, as well as passing $80 million in legislation that would target additional help for at-risk students. "It takes more resources to educate those at risk. It's the largest investment in our city and at-risk kids," Catania said. Bowser has received a handful of union endorsements, but Catania was endorsed in August by the D.C. Fraternal Order of Police. Catania's critics are also eager to mention he opposed city spending on Nationals Park as well as the Walter E. Washington Convention Center, two large-scale projects which have arguably led to major redevelopment in their respective neighborhoods, reported the Washington Post. Catania, who played second base as a child, attended his first game at Nationals Park during the playoffs this fall. He has said that, as mayor, he would fully support the team even though he still thinks the city paid too much for the ballpark. That's the same approach taken by former Mayor Adrian Fenty, who also opposed the $700 million stadium. In mid-September, Catania released a 126-page platform book, "David Catania's Vision to Secure Our City's Future," which he says contrasts with Bowser's. Catania printed 1,500 "glossy, full-colored" copies of the book. "When you put everything you believe on paper, you certainly invite people who have a different point of view to take shots and that's OK," Catania said, after comparing his book with printouts from Boswer's website. "Our residents deserve more than labels and slogans. They deserve vision and hard work." As of mid-August, Catania had $463,000 left to spend through the election, in comparison with Boswer's $1 million and fellow Independent Carol Schwartz's $65,000. Like Schwartz, Catania has agreed to many mayoral debates and forums, and has been quick to comment that Bowser agreed only to attend four debates, a stance that has drawn some criticism for her. "There's simply no way that voters are going to be able to come away after four debates with an understanding of what me and my opponents would like to do as mayor," Catania said.